Prunus is a genus of more than 200 species of deciduous or evergreen trees and shrubs, widely distributed throughout Northern Temperate regions and S. America to SE Asia. They occur mainly in woodland, woodland margins and thickets, but also in a range of other habitats, including coastal sands, rocky places and cliffs. Cherries have alternate, broadly ovate to lance-shaped to rounded, usually toothed leaves. Ornamental cherries exemplify the spirit of Japanese gardens and bonsai when in bloom and it is for their blossom that they are primarily cultivated. There are a vast number of Prunus species and varieties are available, all displaying variations of white, pink or red, saucer- or cup- shaped flowers, usually during the Winter. 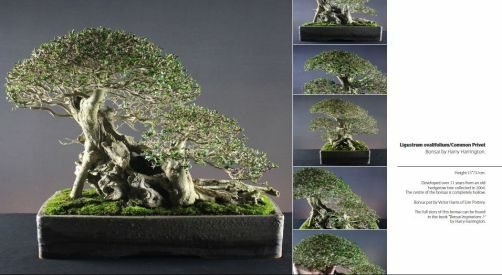 There are equally many varieties suitable for bonsai cultivation and the use of an individual variety is largely dependent on leaf and flower size. POSITION Full sun; provide some shade at the height of Summer. Many Prunus species are fully hardy to at least -10°C but there is some variation across the genus. Check each species and variety for their individual frost tolerance. FEEDING Feed at least every two weeks during the growing season though weekly feeding during the Summer months results in increased flower bud production. REPOTTING Repot annually in late Winter as soon as flowering finishes. PRUNING Prune hard after flowers have fallen, trim back new growth as necessary throughout the growing season. Wire during Spring and Summer as necessary. PROPAGATION Sow seed outside in Autumn; species will come true but varieties need to be vegetively propagated to remain true to type. Root greenwood cuttings in early Summer, semi-ripe cuttings in mid-Summer. Air-layer in Spring. Beware of poor grafts if purchasing from nurseries or garden centres. PESTS AND DISEASES Susceptible to damage from aphids, caterpillars and birds who enjoy the flower buds. Diseases include peach leaf curl, silver leaf, blossom wilt and Taphrina wiesneri which causes witches' brooms. STYLING Suitable for all forms except broom. 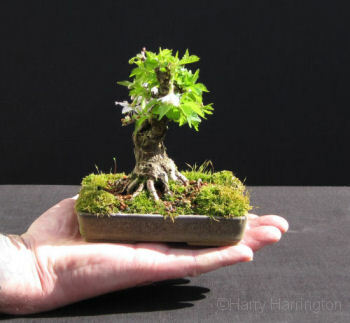 The size of the bonsai should be in keeping with flower size of the variety or species used.